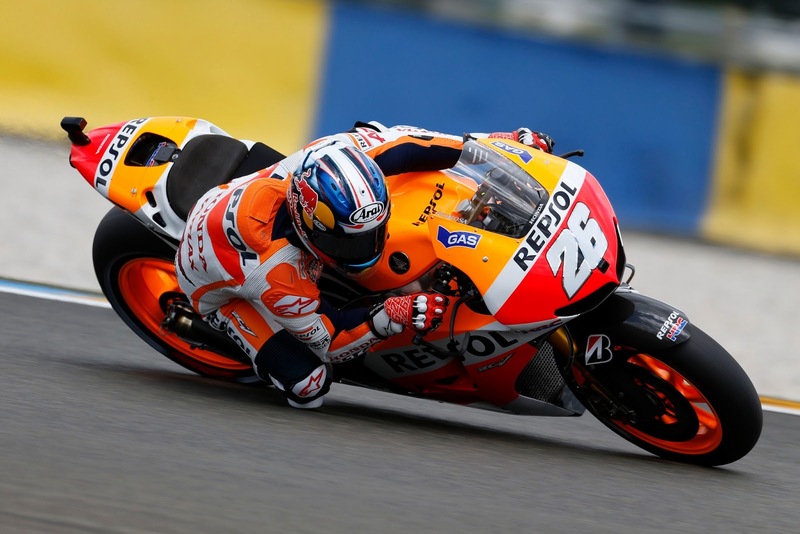 Dani Pedrosa topped free practice on the opening day of the French Grand Prix, starting a Repsol Honda lock-out at the top of the timing sheets. With the threat of rain looming, the Spaniard wasted no time and set the fastest laps in both FP1 and FP2, shaving over half a second off his mornings time with warmer track conditions in the afternoon. Pedrosa made the most of a dry track, and finished the day 0.134 ahead of the rest of the field, with a time of 1.34.035. Spanish teammate Marc Marquez wasn’t far behind his compatriot, finishing the day in second position. At a track where Marquez has been successful at in the past, it didn’t take long for the rookie to feel comfortable on his Repsol Honda machine. He jumped from seventh position in FP1 to second in a warmer FP2 following a calmer afternoon session. His time of 1.34.169 left him just 0.134 seconds shy of Pedrosa.